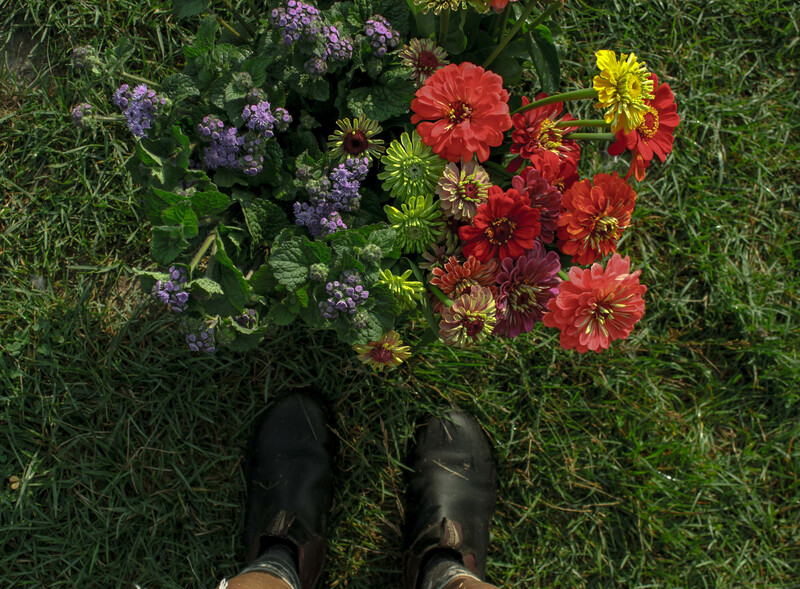 For the second week of Learn the Flowers CSA there were some new bloomers in the field at Laughing Lady Flower Farm as well as a few additions from some friends at a neighboring farm. Before getting down into details about your bouquet, I’d like to point out the photobomber that I noticed in the picture posted on the title journal page for this week. 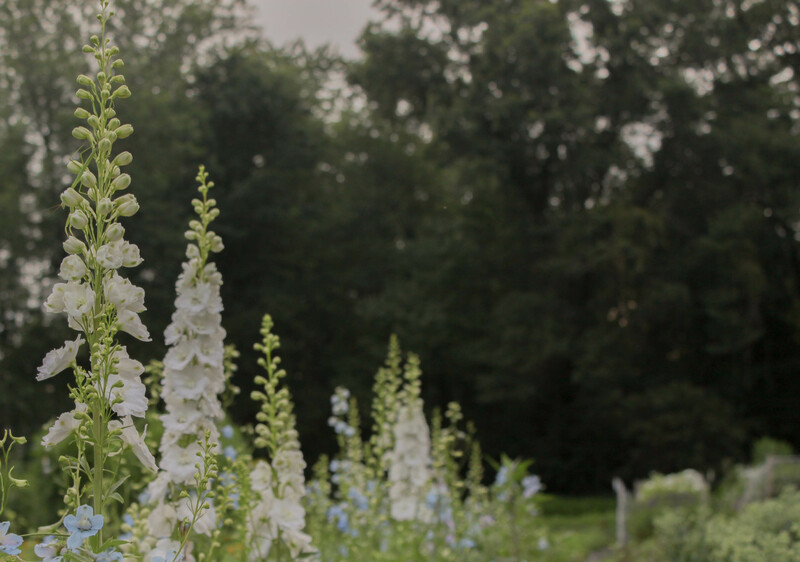 If you look closely at the far left white Delphinium stem, towards the top there is a perfectly-posed praying mantis! These special creatures are so skillfully camouflaged and abundant in our fields, that I’m often jumping back when suddenly, a perceived piece of grass, jumps up and walks away. It only seems appropriate that one of them make an appearance in this journal. 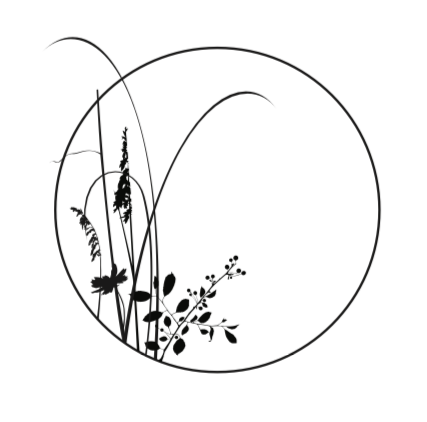 I wanted to mention the term inflorescence in this week’s journal because it is one of the most important terms to know about flowers as well as one of the most confusing, since different botanists may use it in slightly different ways. My understanding of inflorescence is that it is the flowering body part of a plant. Based on the way flowering stems grow, there are determinate and indeterminate inflorescences. There are also different categories based on the varied display of those flowering parts. I bring this up so I can more descriptively talk about the focus of the journal this week: Phlox, Dill & Joe Pye Weed. 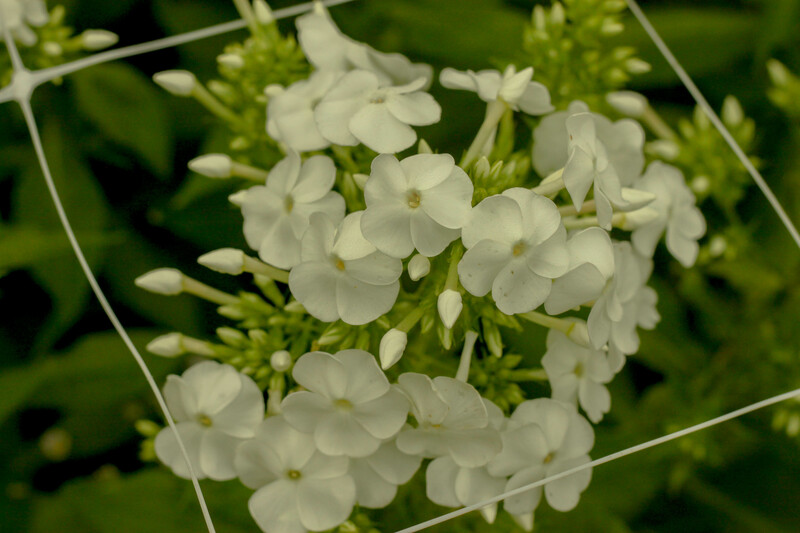 The inflorescence category of Phlox is called a Cyme which is categorized by its multiple levels of flowers, beginning with the very center/top flower which is also the oldest of the blooms on a stem. It’s been a frustrating plant to work with in our field because it’s so beloved by deer and bunnies. As soon as the plant begins to make tender buds, I have to immediately erect a cage made of rebar and plastic netting. (Deer and bunnies don’t really like to get near the netting but every now and then, someone will reach through a hole in the netting and take a bite.) Phlox is also susceptible to a common fungus called powdery mildew. This season our phlox was attacked by the mildew and I attempted the organic solution of spraying milk and baking soda to its leaves. I have yet to see this solution really make a difference but it was challenging to keep up with the daily prevention of spraying with consistent rainfall. Mostly, I think our Phlox could stand to be planted farther apart in order to create better air circulation between the plants and avoid moisture sitting on its leaves for too long after rain. Despite the challenges of fungus and deer/rabbit pressure, Phlox is a lovely cut flower but requires some upkeep to get it through to its beautiful blooming stage. You may have already heard of this one, since the fern-like leaves are often found in things like potato soup and your pickle jar! However, did you know it could make such a beautifully-explosive inflorescence? 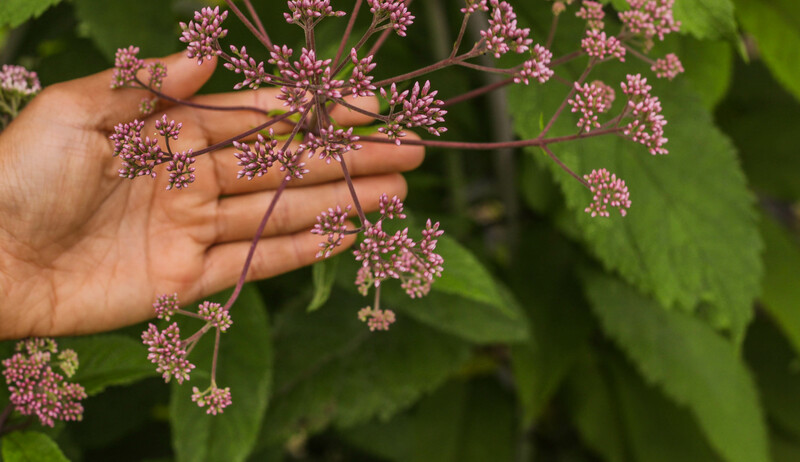 The categorization of its inflorescence is an Umbel which is characterized by its equally-long stalks making up the flower head. These lengths create its umbrella shape. 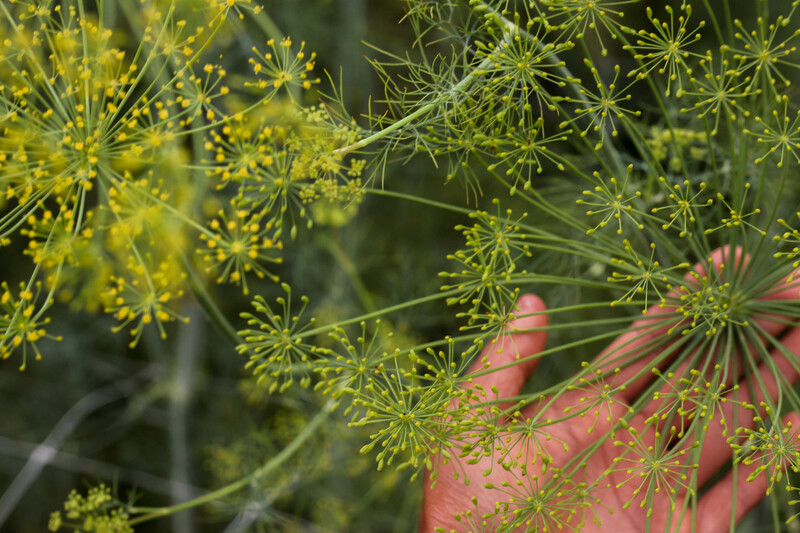 In my experience growing Dill in the field, the best time to harvest is when the first flowering head of dill has been sitting/growing in the field long enough to become stiff, otherwise its stem just flops over. It can be a tricky cut flower to work with as its stem is hollow, so if it gets squeezed or bent a little too hard, the stem can easily break. As a cut flower, it can last a long time. It may even be the last one standing in your bouquet this week! Joe Pye Weed (This particular variety is Eupatorium purpureum…and fun to say out loud) is quite a hardy-stemmed cut flower. It is also commonly known as “Queen of the Meadow” and “Gravel Root”. We pinched some of it at the beginning of the season and it still grew to great heights above our heads! I really love the shape and color of its buds. The stem of Joe Pye Weed in your bouquet is not actually blooming yet. When its little buds bloom, it looks a lot fuzzier and the color is captured in a different way. I like it best in its current bud-formed stage. Joe Pye Weed is great as a cut flower but since it’s a perennial and grows in a tall, dense form, it could also be a great border for a perennial garden or even to create a temporary, natural fencing. I was unable to find the exact origin of the Joe Pye Weed nickname but there is a wealth of information available on its health benefits as a medicinal herb used as a diuretic, nervous system stimulant and cure for gout! I’m curious to hear any stories about friends/family using it as a medicinal herb, but for now I’m happy just using it in bouquets. Another week of success and beautiful bouquets! Also, if you don’t practice this already I recommend you change out the water in your flower vase every couple days along with a fresh cut of the stems. As flowers deteriorate, their dying stems create a lot of bacteria in the water and contribute to a quicker demise. So if you want your bouquet to max out its survival rate, give it some fresh water and a fresh cut after a few days and enjoy those blooms a little big longer. Cheers to you and your second week of flowers!